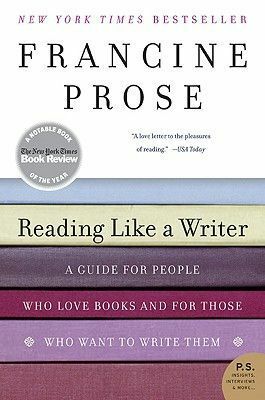 The thesis of this book (“Reading like a Writer,” by Francine Prose) is simple, yet powerful: an excellent way to improve your writing is simply to read. Read those who’ve perfected particular skills and learn to emulate them. The book tours through various aspects of writing (fiction), such as narration, voice, character, dialogue, etc. Each topic is covered like a mini-instructional lecture, and all of the points are illustrated with excerpts from great writers: Austen, Fitzgerald, Woolf, Chandler, and many others I did not recognize. In fact, reading this book is like being treated to an elite buffet: small samplings of absolutely stand-out writing, enough to make you hungry for more in a delightful way. Put every word on trial. Cut away everything that you can, and leave the bones to gleam in solo eloquence. Employ “close reading”: consider each word that exists in the final version you’re reading. Why might the author have made those particular choices? Observe how, for masterful writers, each word conveys just the right information, and a slightly different word would have a different effect. With regard to the common advice to “show, don’t tell”: “This causes novice writers to think that everything should be acted out . . . when in fact the responsibility of showing should be assumed by the energetic and specific use of language.” That is, “telling” is okay if you do it in vibrant, precise ways. Grammar is like etiquette. The writer is the host, the reader is the guest, and the writer should make the reader feel at home. Keep a stack of books that contain, in your view, truly great sentences. Flip through them occasionally for inspiration. To shape a paragraph, and decide where breaks should occur, think of each one as inhaling at the beginning and exhaling at the end. Establish a personality for the narrator through voice, diction, opinions. Good dialogue always has a subtext. Those speaking may have multiple motivations, and these may not manifest directly in what they say. Conversation can advance the plot. In reality, conversation is plagued with inattention and miscommunication. Don’t let fictional conversation be too perfect.